It's official: Seventeen-year-olds can now legally walk into most pharmacies, ask for emergency contraception and buy an FDA-approved product after giving proof of age - no prescription needed. Over-the-counter (OTC) emergency contraception - Plan B - is nothing new. The FDA approved the drug, for prescription only, in 1999. 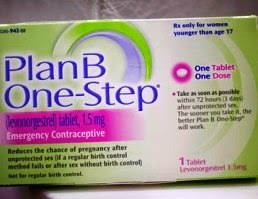 Then, in 2006, Plan B got OTC approval, but only for sale to women age 18 or older. Reproductive rights organizations challenged the age restriction in court, finally receiving a favorable ruling earlier this year. Now, a new product called One-Step - a single-dose OTC version of the same hormone in Plan B - has been approved for anyone over the age of 16. Plan B and One-Step contain a synthetic form of a hormone called progesterone. Birth control pills also contain progesterone, but at a lower dose. Where Do Drug Stores Keep Their Stock Of Plan B? The product has to be kept behind the pharmacy counter. If you want it, you have to ask the pharmacist or pharmacy clerk for the product.A licensed pharmacist has to be on the pharmacy premises when you buy Plan B, although an assistant or clerk can handle the transaction.You need to present some form of government-issued identification to prove your age before buying Plan B. How Do I Know If A Pharmacist Sells Plan B? The simplest thing is to call ahead and ask. Alternatively, your health provider may be able to direct you to local pharmacies where you can get Plan B. Some pharmacies have chosen not to stock Plan B because of perceived lack of consumer demand. But media attention has focused mainly on individual pharmacists and drugstore owners who have publicly stated their religious objections to emergency contraception and made a point of refusing to stock or dispense Plan B. It's unclear whether this stance has made Plan B harder to purchase in general, but courts are already grappling with related issues. The controversy has been particularly heated in the state of Washington. Since 2007, pharmacies there have been required either to sell Plan B themselves or to give any customer who requests Plan B the name and address of a pharmacy where it's sold. What If I Am Not 17 Yet? If you are under 17, you can get a prescription for emergency contraception (Plan B, One-Step or Next Choice, which is a generic, prescription-only version of Plan B) from your medical provider. Title Ten clinics and Planned Parenthood clinics also prescribe emergency contraception. Can I Just Have A Prescription Available In Case I need It? Yes - in fact, that's a great idea! Ask your provider for a prescription when you go for your well-woman exam. Far too many pregnancies are unplanned. If efforts to reduce the number of unintended pregnancies are to be successful, women must be given access to a full range of contraception options.